Today was another widely varied day. We awoke from our wretched slumber in foul moods. Miserable and "never again" were terms bandied about. We commenced to quarreling immediately. Luckily, we were productive in our domestic half-day chores. Enough so that we got to the outback half-past one in the afternoon. We were heading west on the Flinders Highway. Our van contract limits us to within 200 km of the coast, so we we have two destinations for this foray into the outback. 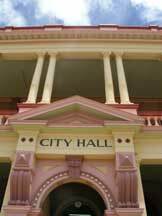 Charters Towers and Ravenswood. 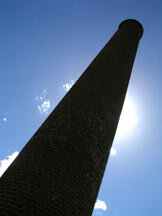 Charters Towers took the nickname "The World" in the 1880s as it was the biggest gold rush town in the world. Money flowed as easily as the beer and people got very drunk. They built a grand city for tens of thousands with architectural splendor. Only thirteen thousand live here now, but that is a second boom for a town all but abandoned for 50 years. After a very informative tour at the tourist info, we wandered about the downtown and found ourselves belly to the bar at the Court House Hotel. In Australia, as far as I can tell (outside the major cities, which are just like everywhere else), hotels are lower rent than motels. This likely has to do with the presence or absence of air-conditioning. No small thing. The bar was cavernous, but well-lit. It had exactly three people in it, spaced equidistantly from each other. We upset this balance and a new equilibrium established itself after we took stools near the barman. I noticed out of the corner of my eye that the place had a jukebox. The walls were covered with posters of US country singers, with the name of the hotel clumsily superimposed, as if they had played here. The barman was bright-eyed, with a neatly trimmed salt and pepper beard, but the wrong side of 50. Or maybe a life out here had aged him. He allowed as how he wrote and sang his own songs. He also shared that he had achieved every dream he ever had as a young man, save one. He longed to play his music at a honkytonk in Texas. I am constantly reminded that it does indeed take all kinds of people to make a world. Lawyer: Do you have any grounds? Cattleman: Ah got 2000 acres, son. Lawyer: Ah, what I mean is, do you have a case? Cattleman: Nah, I got a John Deere. Lawyer: Does she ever beat you up? Cattleman: Most days I'm up at dawn, so no. Lawyer: Is she a little nagger? He also made (for my taste) inappropriate mention of the racial makeup of the town. This I ignored out of courtesy he no doubt didn't catch. One of the other patrons left and in walked a young man who took his exact seat. He was darker skinned, with robust straight black hair and a passable goatee. A talkative fellow, but no blabber, he told us about his work as a truckdriver up and down the east coast, and how he was saving to get his mining ticket. Gold is being mined again in Charters Towers, albeit in modest sums, but there is work to be had. He aimed to drive those monster trucks on the minesite, like his daddy. He had Aboriginal and Torres Straits Islander blood, so the government would give him $3000 to help gain his tickets. His father had been in mining for a long time and even tought the young man how to drive the big trucks years ago. As we were speaking, the father came in with a white woman and sat at the bar. Our barman greeted them warmly and served them. This reminded me of the story my father tells of moving to the south. Where he grew up, no one would ever, ever use a slur. It was just not done. But then, very few people had black friends or really socialized with them. Down south it was the norm to use slurs in everyday speech, decrying the state of the race-mixin world. And then have your black friends over to dinner. We drove up to Tower Hill for sunset and enjoyed a spectacular windy sunset amidst many curious wild rock wallabys. Where are the days going? We woke in Townsville, aka sweatsville, in a pool of our own. Knowing that hotel nights must be the missing key, we set off due west for a little taste of the Outback. Its a true shame that our days here are numbered, as with a longer journey west the road promises more and more interesting and secluded sights. Our limits set on Charters Towers, roughly 200km west of the coast, we experience the remains of Queenslands gold rush town. Its a big place, comparatively speaking, and boasts incredible architecture from the earlier and booming gold-rush past. Today, with its sights set on tourists the town boasts a complete package that is in itself an interesting study. Informational plaques, maps, logos, the information centers tour, the restored buildings are all well presented. The town offers a lot more in the form of friendly locals, true watering holes and undeniable charm. As all dressed up church boys on a sunday do, this town has a muddier underbelly. There were at least 2 times we were asked about color relations in the states, and then offered some local comparisons.